1 of 2 In a large, heavy-bottomed pot, heat oil on medium-high. Add noodles and stir with tongs until golden brown, about 2 minutes. Add garlic, smoked paprika, salt and, if desired, saffron. Cook 1 minute. Pour in 11/2 cups of the seafood stock. Bring to a simmer, then reduce heat to medium and cook 4 minutes. 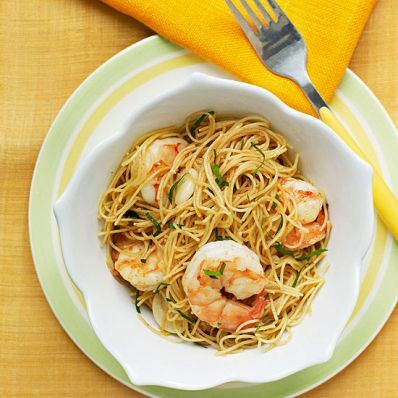 Add shrimp and cook, stirring frequently, for 6 to 8 minutes or until shrimp are cooked and pasta is tender. (If noodles seem too dry, add remaining 1/2 cup seafood stock.) Stir in chopped parsley. 2 of 2 Serve immediately, garnishing with additional parsley.